PRODUCT DESCRIPTION: Microencapsulated synthetic pyrethroid which works well for many insects. Its time released which means that one treatment will last 1-3 months when used for a perimeter barrier on structures. It has no odor and can be sprayed with a pump sprayer or a space sprayer. Comprised of tiny capsules which "release" over time, this active is very good on low crawling pest like scorpions, ants and roaches. Cyonara is also great for use on turf including a wide of turf pests like Ants (Including Imported fire Ants), Armyworms, Azalea caterpillars, Aphids, Bagworms, Black vine weevils (adult), Boxelder bugs, Budworms, California oakworms, Cankerworms, Cockroaches, Crickets, Cutworms, Eastern tent caterpillars, Elm leaf beetles, European sawflies, Fall webworms, Flea beetles, Forest tent caterpillars, Gypsy moth larvae, Japanese beetles (adults), June beetles (adults), Lace bugs, Leaf-feeding caterpillars, Leafhoppers, Leafminers (adults), Leaf rollers, Leaf skeletonizers, Midges, Mosquitoes, Oleander moth larvae, Pillbugs, Pine sawflies, Pine shoot beetles, Pinetip moths, Plant bugs, Root weevils, Sawflies, Scale insects (crawlers), Spiders, Spittlebugs, Striped beetles, Striped oakworms, Thrips, Tip moths, Tussock moth larvae, Wasps, Broadmites, Brown softscales, California redscales (crawlers), Clover mites, Mealybugs, Pineneedle scales (crawlers), Spider mites and Whiteflies. WHERE TO USE IT: On structure foundations, cracks and crevices where targeted pests are traveling or nesting. This could include the sides of your home, up under sofits and overhangs, around any structure adjacent to the home, plants, shrubs, garage, basement, kennel, turf or garden area. In the home, use it on baseboards, around door frames, on molding and generally any surface where activity has been seen. In the yard, use it on lawns, turf, flower beds, mulch islands, etc. RATE OF APPLICATION: One gallon will treat up to 1500 sq/ft of surface area for perimeter pest control. Most homes will use 1-2 gallons per treatment. This product can be applied with any of our pump sprayers or hose end sprayers. In the yard, use 5-10 oz of concentrate per acre depending on the targeted pest. Our 6 Gallon Hose End or 20 Gallon Hose End sprayers make good applicators when yard treating. 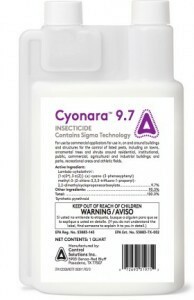 For example, to treat 5,000 sq/ft using our 20 GALLON HOSE END, you'll need to add .75 oz of Cyonara and then fill the sprayer up to the 5 gallon line (that's about 1/4 of the sprayers contents). Next, you'll hook it to your garden hose and spray the entire quantity over 5,000 sq/ft. I have a screened pool enclosure which needs to be sprayed for spiders. I was considering using the Cyonara. Do I need to be concerned about the spray mist falling into the pool? In general, no. Here's why. First, you should only spray using a low pressure sprayer with a "fan" pattern tip. This way only small amounts of product will be coming out under low pressure. And when you spray, you should move the spray wand quickly all the while keeping it within 2-3 feet of the surface you're treating. This way there there will be little to no chance of any mist or spray back. Second, there is no need to "spray heavy". In other words, you shouldn't be applying so much of the mixed product that some might run off and puddle up. Light, quick "blasts" are all that will be needed to get the enclosure treated properly and when using the right amount of mixed spray, the chances of any product relocating will be eliminated. Lastly, even the smallest of pools (like a 15 foot round, above ground pool) would contain so much water that even if some mist got into the water, it would be instantly diluted down to levels that couldn't be measured or impact people. And if the water is chlorinated? Well, the chlorine would kill the active ingredient instantly thereby eliminating the hazard. In summary, the chances of mist or overspray making it to the pool water is remote when the treatment is done properly. And even if some did, there is a good chance it will be rendered insignificant by either the sheer amount of water in the pool or any maintenance chemicals used to keep the water clean. Give us a call if you have other questions or concerns. Our toll free is 1-800-877-7290 and we're open 8:00 AM to 7:00 PM Mon-Thur; 8:30 AM to 5:00 PM Friday and 9:00 AM to 1:00 PM Saturday, Eastern Standard Time. I am thinking of using this for my yard. Is this safe to spray on my vinyl siding and soffits? Also, should I use a fogger instead of sprayer?? If so, do you sell foggers? Does this product work on mosquitos? This would be a fine product to use on the home and turf. And there is no need to worry about using it on your homes siding; it won't affect it any way. Once dry, you won't know its there. Personally I have found the Bifen with Nylar to work great in my yard. But if you want the "strongest" option, go with the Perm SFR, Nylar and Exciter combo. I've been told this is really good for love bugs (I live in a woodsy area of Florida). I am seriously considering painting my house and changing the doors and windows all because of the nastiness that is love bugs twice a year. (You know they are attracted to white). I can't stand them!!!! They are so disgusting and acidic! Can you comment? If anyone knows for sure that this will work, I will plan on having a supply of it instead of paint! Cyonara works well on lovebugs. It will both kill what's on the building and then repel them so you won't have any coming back for weeks. And yes, there is typically two "seasons" so you'll need to treat in the spring and fall to keep them off the home. When treating, use a good hose end sprayer and be sure to spray in the landscape too since they typically like to rest in shrubs around the home too. Something else you should consider is NBS Paint Additive. Add one pint to every 5 gallons of paint the next time you paint your home and it will help reduce the spraying needed because NBS repels all insects. Treatments will last a year so its well worth adding to any paint or stain used on your home for extra protection. Will this work on buffalo grass sod webworms? Surattha indentella Kearfot I believe is the scientific name. This is a good option for all species of web worms along with many other landscape/garden pests.